The Red Reveal Bouquet bursts onto the scene with a bold beauty that cannot be denied! Ready to celebrate any of life's special moments, this daring bouquet weaves together rich red roses, red gerbera daisies, red carnations, and red Peruvian Lilies with lush greens to create a simply unforgettable gift of flowers. 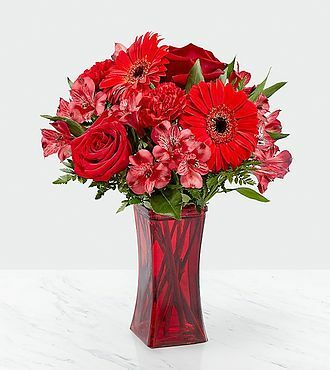 Presented in a modern red glass vase to add to the drama of this arrangement, this flower bouquet is set to send your thinking of you, happy birthday, or, "I love you," wishes across the miles. STANDARD bouquet is approximately 14H x 12W. DELUXE bouquet is approximately 14H x 13W. PREMIUM bouquet is approximately 15H x 14W.